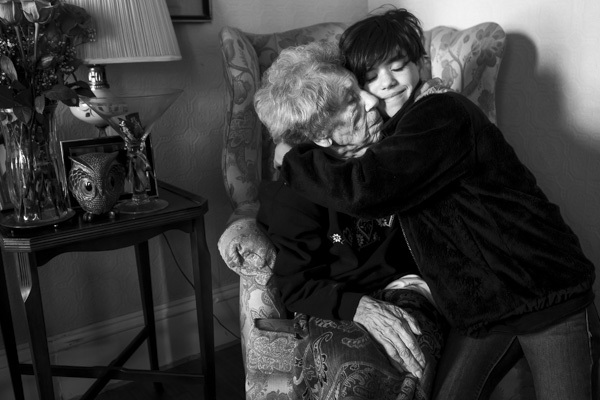 The hands of Alice Mendes,105, and her great-grandniece, Sophie Friend,12, lie intertwined on Alice's lap. Alice Mendes remembers walking in the Victory Day parade in Newport, RI after World War I ended. This may sound unlikely given that World War I started over a century ago but the day before I photographed her, Alice celebrated her 105th birthday surrounded by friends and family members, including a good number of great grandchildren and great-great grandchildren. Alice immigrated to the United States as an infant from Cape Verde in 1910. While she spent her early childhood in Newport, she and her family moved to New Bedford when she was 10 and she has been there ever since. “Things were really different back then. No gas stoves, no street lights or traffic lights. I remember my mother getting up early in the morning to start the coal stove so that the house would be warm when we woke up,” she explains. Alice also remembers going down New Bedford harbor to see the boats of immigrants arriving. “We’d stand on the sidewalk and wave to them as they were coming in,” she says, her eyes bright and animated. Alice spent much of her life working as a nanny and housekeeper and married the love of her life, Jimmy Mendes, a professional boxer and fisherman who ended up dying at sea in a storm. Together they had daughter, Barbara, and also raised four other children Jimmy had had with his late wife. Today, Alice lives in her home in New Bedford with her daughter, Barbara Teixeira, 82, and her granddaughter, Cindy Teixeira, 58. In warm weather, she sits outside on the porch and waves to the many people she knows who pass by. “People always wave to me and often they stop to talk,” she says smiling. “Aunt Alice’s house was always the center of our family gatherings,” says her grand-niece, Melissa Alves. “I have wonderful memories of New Year’s Eve parties where there’d be Cape Verdean music playing and everyone would be dancing…including Aunt Alice of course. She is the clear matriarch of the family–the person we all come to for advice. She just commands respect and has always been stylish and cool,” she adds. 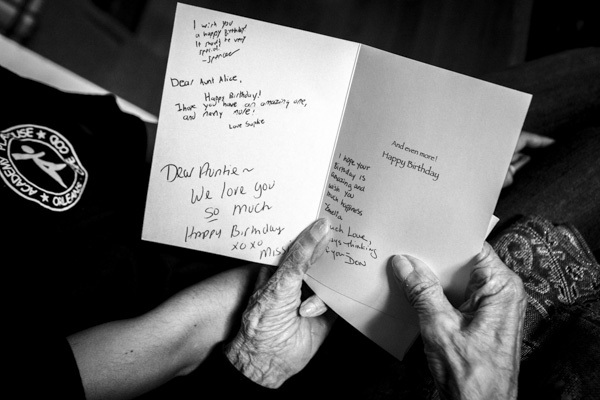 Melissa’s own daughter, Sophie Friend, 12, became pen pals with Aunt Alice a few years ago. Sophie and Aunt Alice have shared a strong bond for as long as Sophie can remember and during our visit, that bond was apparent in their sweet embraces and the way they sat together talking and holding hands. “How long has this love affair been going on for?” Alice asks, laughing and looking at her great-grandniece adoringly. Both Sophie and Aunt Alice have saved their stack of lovingly-written letters. It’s easy to see why people are so drawn to Alice. She’s quick to smile, speaks in a clear, strong voice and her hands reach out to hold a hand or touch a shoulder or fold someone into a hug. 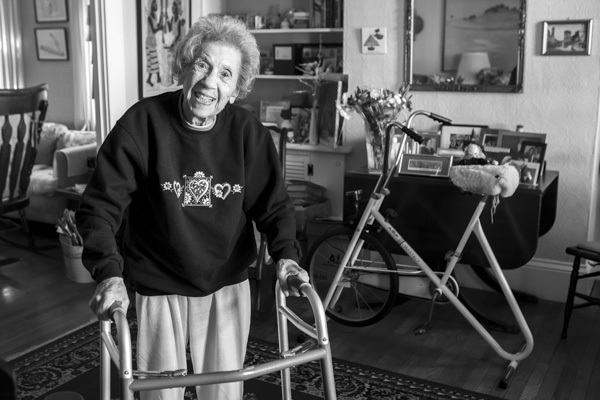 Despite her 105 years, Alice is astoundingly healthy. She exercises in her home by walking or doing arm movements, eats a healthy diet and takes only blood pressure medication and vitamins. “She still eats like a horse and has all her own teeth!” laughs her daughter, Barbara. What’s perhaps most striking about Alice is that at 105 years-old, she still seems so engaged in the world. “One of the reasons we all love being around Aunt Alice is that she is always interesting and interested,” says Melissa Alves. Watching Aunt Alice connecting with Sophie, her eyes sparkling and hands animated, I thought of the Jules Renard quote, “It’s not how old you are, it’s how you are old,”. As we prepare to leave, Alice stands up and, with the help of her walker, accompanies us to the door. Each of us gets our own special Aunt Alice hug and she stands in the doorway, small but determined, waving goodbye until we’re out of sight. Aunt Alice and Sophie share a blissful hug during our visit. The two have always had a powerful connection and have been pen pals for the past few years. Aunt Alice reads the birthday card Sophie brought for her from her family. An old photograph from 1953 shows Aunt Alice (third from left) with daughter Laurie, husband Jimmy and daughter Barbara. 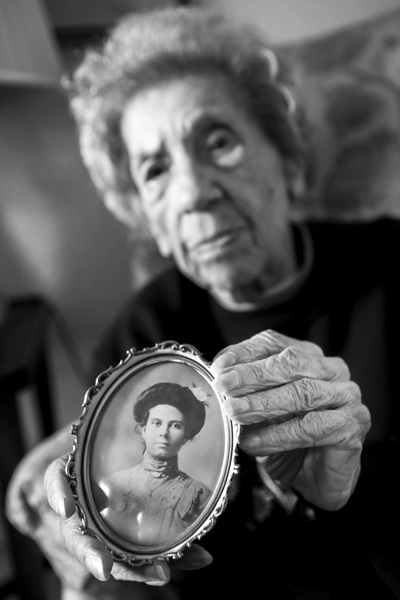 Aunt Alice holds an old photograph of her late mother, Theresa Monteiro, whom she adored. “She was a wonderful cook and such a hard worker. I remember her getting up early in the morning to start the coal stove so that the house would be warm when we woke up,” she explains. Alice insists on walking us to the door to say goodbye and then waves until we're out of sight. I strive to make “Apertures and Anecdotes” an interesting place of discovery–-a place to engage in photographs and stories about the extraordinary people and places of the world and lose oneself for just a short time. If you or someone you know would like to receive new “Apertures and Anecdotes” blog posts via email, please contact me at julia@juliacumesphoto.com. Thank You!